Whether you work in the railyards, on the platform or on the tracks, you’ve come to the right place for your railway safety clothing. 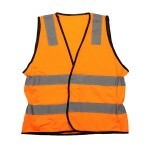 Manufactured in Australia, all of our rail safety vests come in fluorescent tricot special purpose orange – designed specifically for use in Vic or NSW Rail. Plus, the tough, lightweight polyester build, topped with bright 50mm reflective tape will keep you safe and comfortable on those long days or nights at work. Add your logo, buy online, and save! Our easy customisation service lets you add your logo or design right when you order – then just hit submit and we’ll ship it to you, fast! Vic Rail Safety Vest Do you have work on the Victorian Railways? 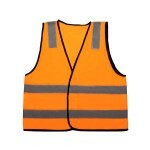 You’ll need one of our special purpose rail safety vests. 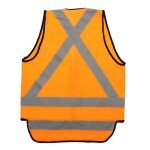 Our Vic Rail safety vest features special purpose orange colouring an..
Vic Rail Elasticised Safety Vest with Tail Working on the railroad in all weather conditions is tough. Your safety gear needs to be tough too. Our Vic Rail elasticised safety vest is designed with h..
NSW Rail Safety Vest Working on the railway is tough, and our vests are built tougher. 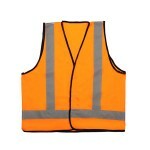 Made from lightweight, durable polyester in bright, fluorescent special purpose orange, you’re sure to be..
NSW Rail X-Back Safety Vest with Tail Working on the railway can be dangerous, especially at night. You need a rail safety vest that keeps you seen and safe in all weather. Our NSW Rail X-back safet..